Looking straight up into a cloudless sky over King Street today, I saw this crow dive-bombing a hawk. Crows often harass raptors (birds of prey), because they represent a threat to their young. It is unusual for a single crow to challenge a hawk, however, because a hawk can kill and eat a crow. 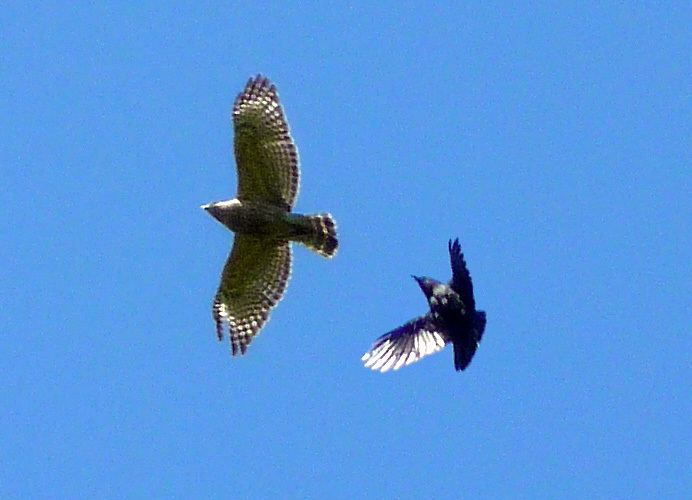 Indeed, at times during this dogfight the hawk looped and counterattacked the crow. Which bird won? I don't know, because they veered beyond the treetops before the bout ended. But notice that the hawk has lost one of its right primary feathers. I wonder if the crow had anything to do with that.